If you haven't received an email or Facebook message in the past week with the link to the Maccabeats video of "Candlelight", you might want to check that your computer is actually plugged in. 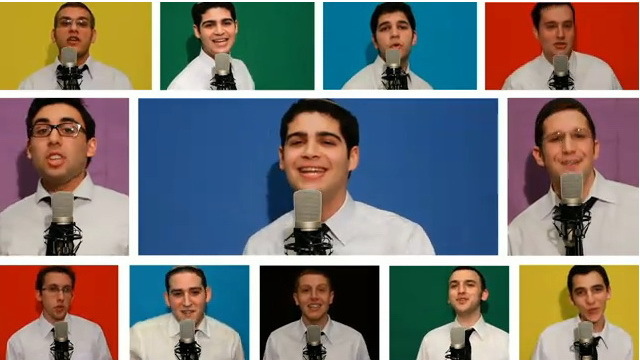 The Yeshiva University a capella group's video parody of Taio Cruz's song "Dynamite" (based on Mike Thompkins' a capella version) has gone viral surpassing 1.5 million views on YouTube and even landed them an appearance on NBC's Today Show. Now, the group is campaigning to get an invitation to the Colbert Show (add your voice here). ERRAN BARON COHEN (SACHA'S BROTHER) SINGS "DREIDEL"
Neil: The Leevees "How Do You Spell Channukkahh" song is posted on my blog (look at today's post). Neil: I wrote about Orrin Hatch's Hanukkah song last year. Check it out here.